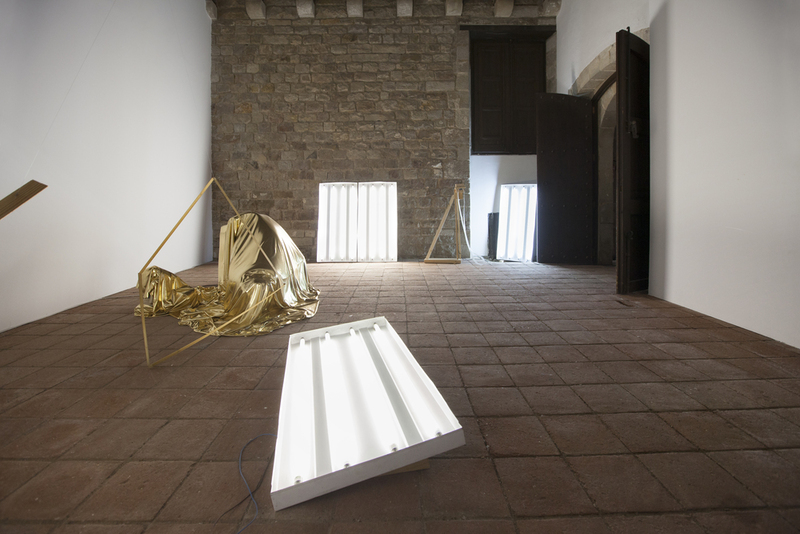 In collaboration with Tangent Projects, Lolo y Sosaku exhibited a new installation at Fundació Gaspar between May 7th and June 19th 2016. "GOLD" was an installation in two parts. As a complimentary juxtaposition to their new work, "Gold", Lolo y Sosaku chose to include an updated version of an earlier piece, "Dancer" (2015). 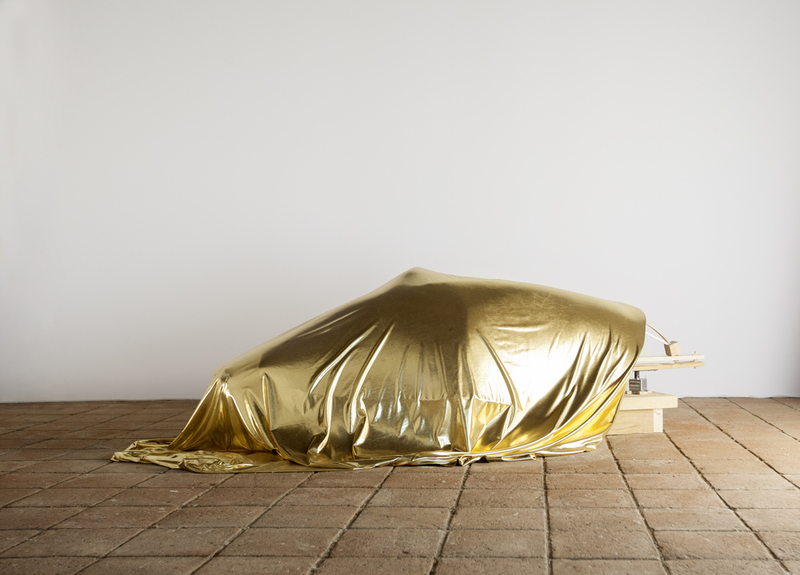 With its visual impact and subtle cadence of movement, the new installation work by Lolo y Sosaku, "GOLD", stands apart from previous works by the artist duo. The sculpture has progressed from representing an instrument and has become an interpreter of an instrument instead. 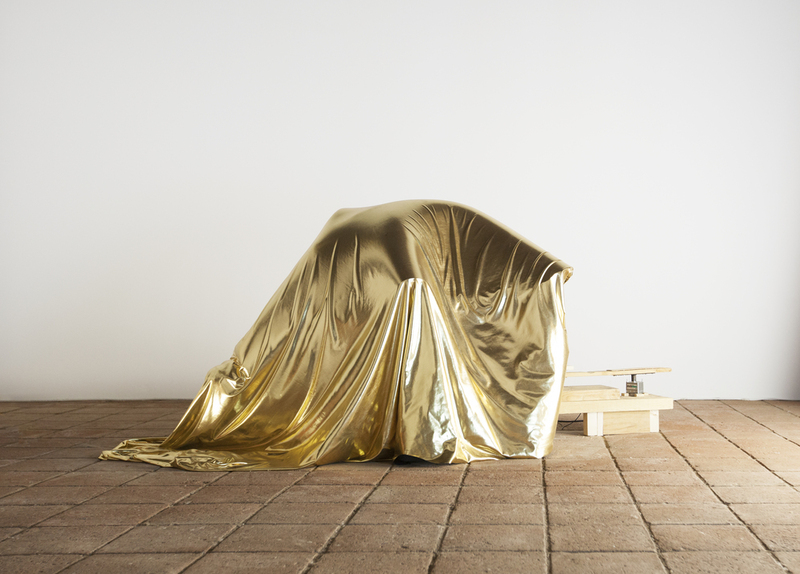 In order to gather kinetic, sonic and visual life, "Gold" moves with the help of an integrated motor while a large golden cloth covers and hides the usual nakedness of its structure. Thus, questions about the content and the superficial arise and add up to a multi-sensorial hypothesis, conducted through the observer. Cloaked in a resplendent golden cloth, "Gold" radiates energy and vitality as it manoeuvres with its breath like motions. By contrast "Dancer" - while similarly aided in movement by an electronic motor - is naked, exposed and delicate, yet at the same time does not capitulate to feebleness or fragility, instead revealing strength in ever changing form and movement. Acting as dual forces, "Gold" and "Dancer", communicate with one another through independent rhythmic movements and the reflected light and shadow they create around one another. You can see photos of the install and opening here or enjoy some documentation shots below. Lolo y Sosaku in Rio de Janeiro. Courtesy of Frank Kalero. Lolo (Leonardo Fernández Miyazaki, 1977, Buenos Aires, Argentina) and Sosaku (Sosaku Miyazaki Fernandez, 1976, Tokyo, Japan) both live and work in Barcelona, where they have collaborated as an artistic duo since 2004. Their main body of work combines visual art and music, with a special interest in the perception of raw sounds - generated by pendulums and physical interaction - which are captured through contact microphones. Their recent sculptures tend to function with implanted motors and mark an important turning point in their body of work, still, yet to be pursued.